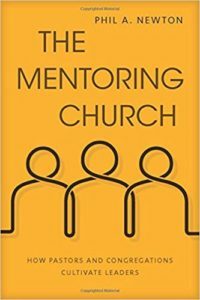 In The Mentoring Church: How Pastors and Congregations Cultivate Leaders, Phil A. Newton presents a biblically and historically grounded process for churches to seek to develop and train leaders. The book begins with a practical call for churches to train and develop leaders within their own contexts. This approach to leadership development keeps growing leaders serving in the context of a local church while also training them in how to minister to others. The book then goes on to explore mentoring throughout the Bible through the leadership development processes of Jesus, the early church, and the Apostle Paul. After laying the biblical foundation for mentoring and leadership development through the practical leadership insights of the New Testament, Newton explores leadership development throughout church history. He focuses on Zwingli, Calvin, Spener, Gano, Spurgeon, and Bonhoeffer as the historical examples. The variety of contexts, timeframes, and traditions represented in the sample of examples makes these chapters very helpful and interesting as well. Newton also builds a theological case for the development of leadership in the context of the local church before moving to several modern day examples of how mentoring leaders is effectively done. These examples include Mark Dever’s Capitol Hill Baptist Church in Washington DC, J. D Greear’s The Summit Church in Raleigh-Durham, North Carolina, Scott Patty’s Grace Community Church in Nashville, Tennessee, and Al Jackson’s Lakeview Baptist Church in Auburn, Alabama. The four different approaches exemplified by each church forms a helpful springboard for ideas for those looking to effectively mentor leaders in their church. The Mentoring Church concludes with a template for a leadership mentoring program to be developed as well as some recommended resources for different topics for churches to cover with mentees. Newton has written a very helpful and thoughtful book for those seeking how to effectively train and mentor leaders in the context of a local church.